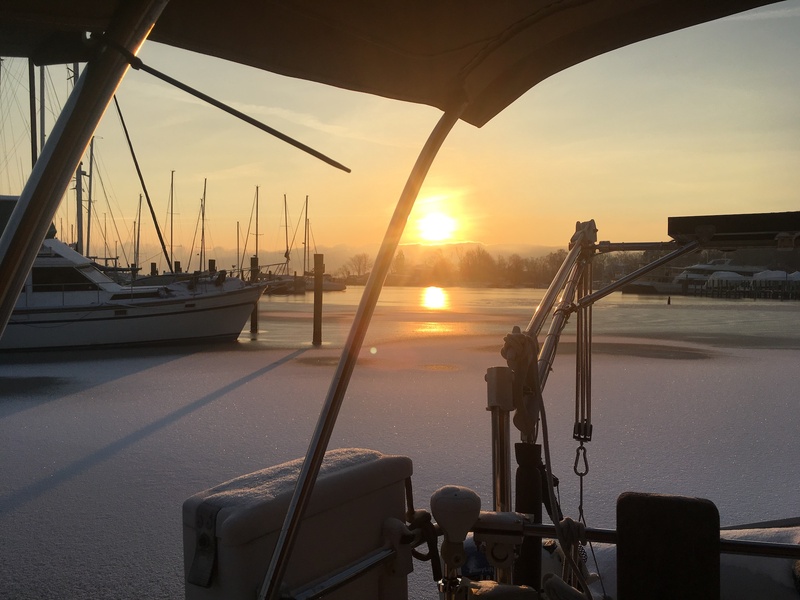 A lovely, chilly sunrise as seen from the cockpit of Further in her slip on Back Creek, Annapolis. Fortunately, there hasn’t been much ice this winter — unlike last winter. I got taken to task in a recent email from a friend — leave it to a fellow hockey player to rip me a new one — for not keeping this site current. And you know what? He’s right. So let’s do a quick update. For starters, Further and I are now winding down our second winter of living aboard in Annapolis, Maryland. And this winter, thankfully has been a LOT mellower than last winter. 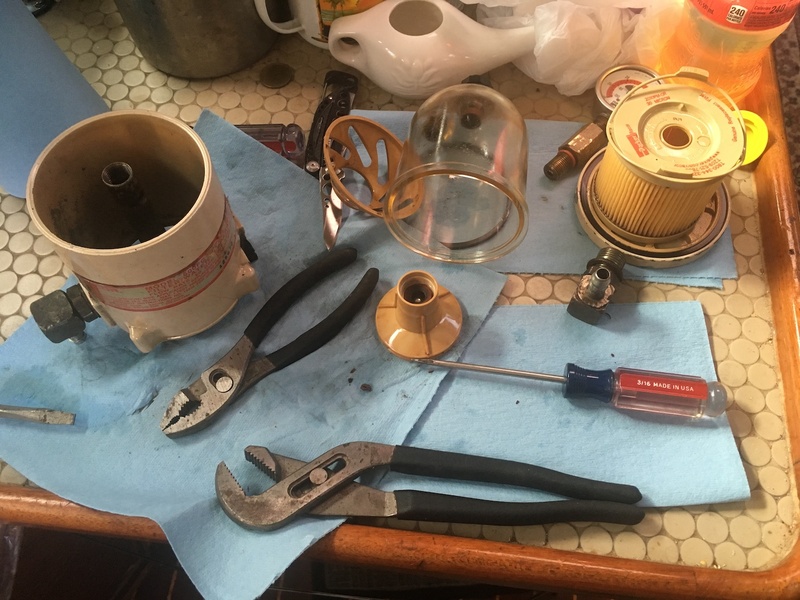 Last year, we were iced in for a solid month; this winter, I took down my Christmas lights on New Year’s Day while wearing a T-shirt in 60-degree weather. And where I planned to sail a bit last winter (but didn’t), this year, Further and I were out on the Chesapeake three times during January. No, it wasn’t always warm but it wasn’t bad. Sadly, February’s weekends were crappy enough that I didn’t get Further out at all. But now we’re in March and the days are getting longer. We’ll spring our clocks ahead an hour next weekend, which will lengthen the evening’s daylight hours. 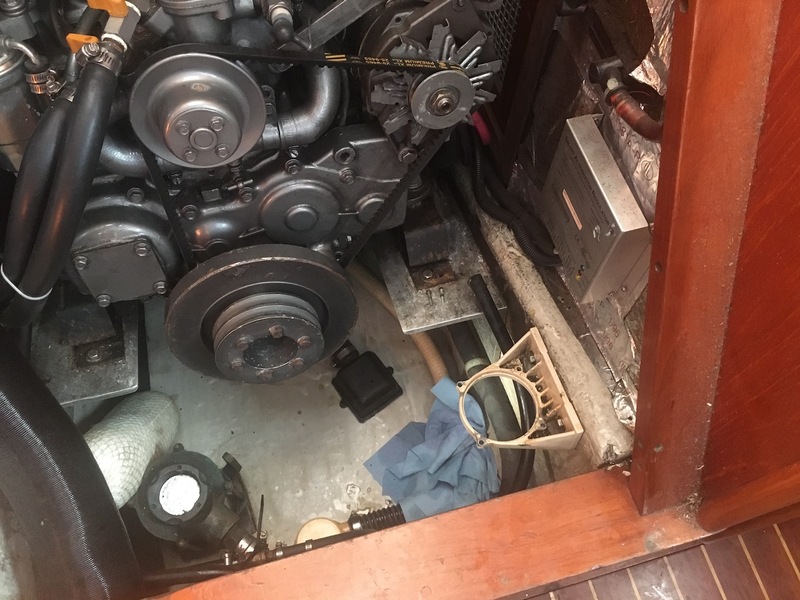 And as the winter weather lessens its grip a bit, I’ll be able to put some things away — an extra tarp lashed over the dodger and bimini, the supplemental electric heater in the cabin, etc. 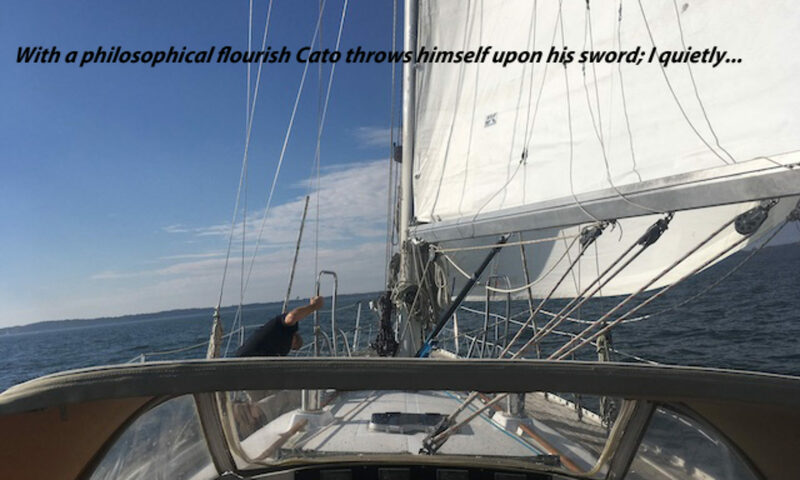 — so that throwing off the lines doesn’t take longer than the sail itself. Speaking of the dodger: I ordered a new one back in November and traded emails this week with the company that will be doing the work. They’re going to come out and take measurements on Wednesday or Thursday, so I’m hopeful not too long thereafter I’ll have a new, larger, better dodger than Further currently sports. That will make going out in inclement weather less of a drag and, therefore, more likely. Otherwise, this winter has been pretty straightforward: the Patriots won another Super Bowl, I’ve been playing hockey a couple of days a week at the U.S. Naval Academy and I’ve been working at S&J Yachts, a yacht brokerage located across Back Creek from my marina. 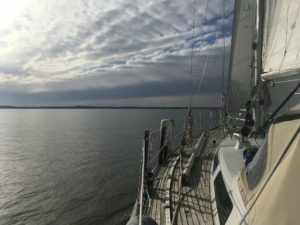 Further has been out on Chesapeake Bay three times this winter. She’ll get out there more often as spring continues its push north. At which point, I’m supposed to segue into being trained to be a broker. I’ve been both looking forward to that step, and also a little wary of it. My track record with sales is none too good. But as many of you know, I get really passionate about boats and sailing and the ocean, so I believe I could actually be pretty good at it. I have no interest in being a used-car salesman but I do have an interest in making a living in the marine industry. The thing is: I’ve been hearing since I joined the brokerage that “next week, when X, Y, Z is finished, we’ll go over this, that and the other thing, and get you started on selling.” I joined the firm before Thanksgiving so it’s now been more than three months and not much has really happened. Yes, sales is all about initiative and I should show some. Or show some more is maybe more accurate: I’ve improved an existing listing here and done a couple of courtesy showings there, but beyond that…de nada. And none of the promised assistance (an email list of potential clients from an old boat show, for instance) has ever materialized. Anyway, that’s been the winter of 2018-2019 for Further and me. I hope to have a lot more frequent updating in the coming weeks as we emerge from hibernation and get more active. In the meantime, follow us on Instagram where I post photos semi-frequently. Thanks for your support…and stay tuned!